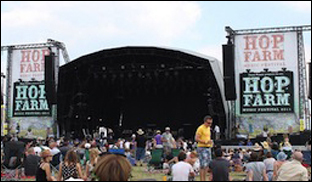 LONDON (VIP NEWS) — The Hop Farm music festival has announced the cancellation of this year's event because of poor ticket sales. The festival had been due to take place in Kent on Friday 5 July and Saturday 6 July. It was due to be headlined by My Bloody Valentine and Rodriguez. Organizer Vince Power said in a statement: "We have worked very hard to try to make it work but it has proved too much of a mountain to climb." Others on the bill included The Horrors, Jimmy Cliff, The Black Angels, The Cribs and The Presidents Of The United States Of America. Ten thousand tickets were available for this year's event, even though the festival made a loss in 2012. The previous year, 2011, was a sell-out featuring Prince, the Eagles and Morrissey as its headliners. The statement said it wanted this year's acts to know they were "very sorry not to be able to have them play". It added: "We would also thank the fans that have supported us over the past five years. It is with great sadness that the decision was made." Ticket holders will receive a full refund from their ticket agents.